Space Lilly claims itself to be the “Top Space Casino Online” which is quite the boast for a site that only has about a year’s experience in the iGaming market under its belt. Granted, this is not quite as boastful as those new sites which arrive on the scene and immediately announce themselves as the best online casino in the world. But, with the mass of online casinos that exist, and the constant popularity of space as a concept (which has not been hurt by the resurgence of the Star Wars franchise), Space Lilly is still not going to have an easy job of proving its superiority amongst similarly themed sites. With over 900 games, customer service that has already developed a favourable reputation, and impressive promotions, Space Lilly certainly seems competitive. In case you had not figured it out yet, the theme of Space Lilly Casino is space. Lilly herself greets you as you arrive at the homepage, she is a superhero like character wearing yellow, who stands atop a rock on a mystical planet with an incredible gold clad city in the background, and other planets and moons further back. This really is a striking image, and with promotions and more information appearing sporadically in front of it, it captures the attention of players very quickly. As you scan down the page there is a simpler space theme, with stars in the background, but it is equally effective, making the concept of the site immediately immersive. Thumbnails are available on the homepage which allow you direct access to a host of the best games at the Space Lilly site, something that is almost a necessity at this point. These thumbnails are incorporated into the design here, not feeling at all like they’ve been added out of that aforementioned necessity. It sounds like quite the claim, but, design wise at least, Space Lilly might actually be the top space online casino. A great start in terms of design, but if Space Lilly really is going to back up its boast of being the best of all of the space casinos, then it needs to bring some serious content to that table. With games at the site coming from BetSoft, BOG, Evolution, Ezugi, GameART, GGL, iSoftBet, Kiron, Microgaming, NetEnt, OneTouch, PariPlay, Pragmatic Play, and Quickspin, serious content is definitely what Space Lilly has. With almost 1,000 games on offer, you’re bound to find something that takes your fancy here. 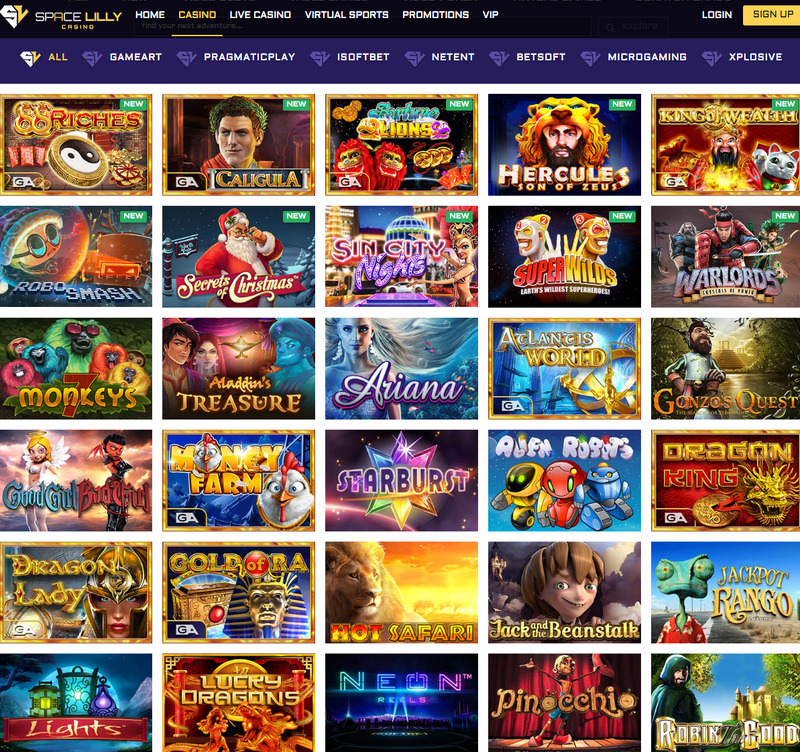 If you like slots, you’re nothing short of spoilt, with a plethora of new releases, old favourites, and classic slots available. Table and card game fans will be delighted with the choice available too, with several varieties of your favourite table games, and an impressive live casino (courtesy of Evolution) if you like that true to life experience. With a few virtual sports games thrown in as well, Space Lilly does not hold back with the host of games it offers to players, and combined with the excellent design work and customer service, this really is an excellent site. But, is it the top? Maybe.